Best signs in CA as far as I'm concerned. As with any other investment, though, it’s important that boat wrapping is done the right way and by the right people in order for it to actually be worthwhile. This is where Cogent Signs & Graphics, Inc. comes in. We’ve worked on all types of marine vehicles and have learned numerous techniques and technologies in the industry. If you’re looking for a trusted signage provider of long-lasting, high-quality boat wraps, Cogent Signs & Graphics, Inc. is here for you. Call Cogent Signs & Graphics, Inc. today at (949) 284-6977 for your Free Consultation! 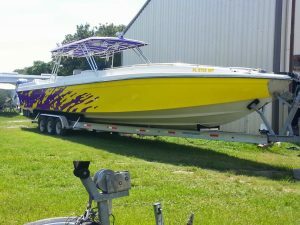 Cogent Signs & Graphics, Inc.’s boat wrapping service can give your boat the exact look, color, and appeal that you’ve dreamed of. And that’s not even the best part! You can give your boat a custom facelift without having to go through the long, tiring, and expensive process of sanding and painting it. If you want your watercraft to have a new look, the premium 3M vinyl that Cogent Signs & Graphics, Inc. uses can be removed cleanly anytime within five years. It’s a convenient and affordable way to keep your boat wrap design (and advertising content) up to date. 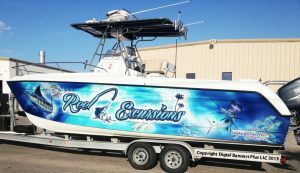 Cogent Signs & Graphics, Inc. is not only capable of working on your boat wrap designs, we also have the equipment to bring them to life! 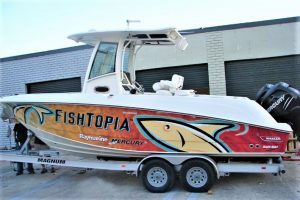 With full-color and high-resolution printing, we can offer you superior graphic designs for both full and partial boat wrap projects. Vinyl is generally better at standing against fading than paint. This is why Cogent Signs & Graphics, Inc. uses top quality 3M vinyl that is warrantied against fading and that can last up to seven years. You can rest assured that your boat’s design will stay attractive and impactful even when it regularly faces harsh outdoor elements such as saltwater, the wind, and the sun. We all know that vinyl is more easily scratched than your boat original finish, however, this is offset by how easily and affordably you can repair them. Cogent Signs & Graphics, Inc. can help you out with that. By removing the damaged portion of the vinyl and patching it up with one that matches the color or design, we can fix instead of replace your boat wrap and you won’t even notice the difference. For damages on boat wraps that were custom-made by Cogent Signs & Graphics, Inc., all we have to do is search for your design on file and simply reproduce the damaged section of the wrap and use that as the patch. With Cogent Signs & Graphics, Inc.’s products and services, you get so much more than you pay for. Cogent Signs & Graphics, Inc. has been doing vehicle wraps long enough to know that in this business, the only way to nurture long-term relationships with our clients is through a good understanding of your needs and the superior quality service to deliver them. With Cogent Signs & Graphics, Inc.’s tried-and-tested processes, premium materials, fine craftsmanship, and undeniable knack for art, you can expect a unique boat wrap design that speaks your brand and, at the same time, fits your budget. Cogent Signs & Graphics, Inc. is confident to say that we can make your boat wrap investment pay off with a customized design, top quality materials, and professional application. Our knowledge in the business can also help you determine how to go about in your boat wrap choices. Cogent Signs & Graphics, Inc. would be more than happy to introduce you to the world of boat wraps and how they can be a great advertising option for your business. Call Cogent Signs & Graphics, Inc. today at (949) 284-6977 for your Free Consultation with a Boat Wraps Expert! Great decision to work with Per and Cogent!